When you decide to book your first consultation, you can either call the clinic and speak to one of our friendly team members or online booking is also available. We run an extremely busy clinic and therefore do not typically have availabilities on the day you call. If you are in significant pain please tell the person on the phone, and we will do our very best schedule an appointment on the day you call. If you have any questions or concerns prior to booking, the Dr. will personally call you to answer any questions you have regarding condition. We will be happy to put you at ease prior to your first consultation. Bring any previous x-rays or scans that may be relevant to your condition. 3. WHAT TO DO PRIOR TO FIRST VISIT? Pain killers or anti-inflammatories may mask your symptoms. 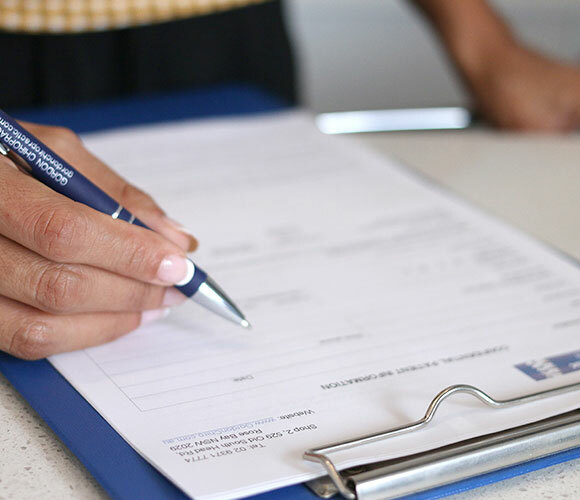 Therefore one of our professionally trained team members may ask you to avoid taking any medication that may mask our test results prior to visiting our clinic. She may give you other recommendations on pain relief strategies. When you book your consultation you will receive a confirmation email with an attachment to add the appointment directly to your smart phone or computer calendar. You will also receive a reminder email and sms the day before your appointment. You will find convenient free street parking close to the clinic. When you first come in to the clinic you will be greeted by a friendly smile from one of our professional team members. She will sit down next to you and help you go through the new patient admission procedure. We pride ourselves on not running late, but because we are incredibly busy sometimes it is unavoidable. You will be able to have a glass of cold filtered water and relax whilst reading the latest magazines. The Doctor will come out and great you with a welcoming smile. He will guide you through to the examination room. The Doctor will listen intently to you and ask any further questions regarding your condition and how it is impacting your life. He will give you a brief introduction on what Chiropractic is and will tell you that the main objective of your initial consultation is to determine if Chiropractic can help you. For your modesty there is a private changing cubicle where gowns are available. During the examination the Doctor will test all the nerves, muscles and joints of the spine including shoulders, elbows, wrists, knees, ankles, feet. He will use a nervoscope , which is the most reliable and advanced technology known to determine nerve inflammation. Most likely the Doctor will refer you for a full spine 3D EOS X-ray. These are the most advanced X-ray machines in Australia. They will give us the clearest image for the most accurate diagnosis. If you have a medicare card the X-rays will be bulk billed, which means you have no out of pocket expense. To determine how severe you problem is. We will be able to see wear and tear on the x-ray. This information will tell us how long the problem has been there and give us an idea of how long it will take to correct. Rule out any severe pathology. After the Doctor has compiled all the results he will discuss your care recommendation with you. It is advisable that you bring a family member or friend with you, as most people like to have the support when they are making important health decisions. The adjustment is very safe and gentle. It involves no rotation of the spine. It is safe for babies as well as patients in the 90’s. The adjustment you receive is very specific and accurate aiming to move the joint where it needs to go back, rather than just cracking the joint. Most new patients are surprised at how gentle the adjustments actually are. There may be a small popping noise during the adjustment, this just means gas is being created in the joint. It does not hurt it actually feels really good. Your Chiropractor will give you a folder outlining the problem areas and how they relate to your specific health concerns. You will also receive a “Do’s and Don’t” list which will outline what you will need to do and not do after the adjustment. This includes exercise advise, posture recommendations as well as activities to avoid. It is highly likely that you will feel immediate relief because we have taken significant pressure of the nerve. You will most likely also notice an improvement in movement and your ability to stand up straighter. Approximately 10% of people will experience “post adjustment soreness”. This discomfort is similar to the feeling you get after having a big workout at the gym. It may feel a little tender or bruised. This will settle down within 24-48 hours. Our aim is to help relieve your symptoms ASAP and then give you strategies to prevent the problem reoccurring. This process is accomplished in as few adjustments as possible. We consistently see significant, life changing improvements, within 4-6 visits, which is an incredible record.